In this post, we discuss challenges that must be overcome for the Government to meet targets set out in its 2017 Drug Strategy. The conditions for addiction to thrive have never been so apparent. 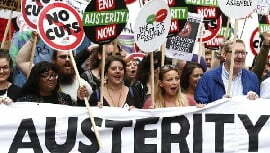 These conditions have arisen due to years of austerity measures coupled with poor economic growth and high inflation. These measures have caused the degradation of public services in the UK. All of these factors put considerable strain on low socio-economic groups. When people struggle to afford their daily essentials, their mental health begins to suffer too. People become hopeless and turning to drugs and alcohol offers a short-term solution to these problems. However, when addiction arises, the costs to individuals and society are untenably high. The relatively poor economic outlook coupled with deep austerity measures has contributed to homelessness, addiction, poor mental health, domestic violence and a seemingly never-ending list of other forms of social deprivation. All this comes at a time when addiction services are being closed down or cut back across the country. Budgets are being cut, staff are being let go and some services are ceasing to exist entirely. This is occurring at a critical moment when an ever-increasing number of people are requiring these services. It’s thus not surprising to see a resurgence of the far-left. At the time of writing (October 2018), the Prime Minister has just announced an end to austerity measures, saying people need to see ‘light at the end of the tunnel’. The cynic in me says this declaration of intent is motivated more by fear of Labour’s growing popularity that it does her genuine desire to help the less well-off in society. We have witnessed the dismantling of our public health system in regards to addiction treatment. These cuts are really just short-term fixes in terms of costing the taxpayer less money. They only serve to put pressure on the NHS down the line who ultimately have to pick up the pieces when vulnerable people require hospitalisation. These cuts are clearly pushing addiction services to their limits. This is particularly shameful given the number of new drugs hitting the street such as spice and other synthetic drugs. Another problem is that these cuts are meaning drug and alcohol support programmes are being combined. This might not sound like much of a problem on the face of it, but in reality, it often deters people with a drinking problem from attending. The cuts have dramatically reduced the number of people working in outreach and active support roles. This means it’s often difficult to keep people in community treatment programmes. Local doctors are also being put under pressure because of these cuts. It’s estimated that around one in three local doctor visits is related to alcohol. Clearly, the NHS is picking up the tab later down the line. Rehab 4 Addiction is a specialist helpline set up to help those who are effective by alcoholism and drug addiction. Because addiction is a physical addiction, it’s important to undertake a detox with medical supervision. This level of care is offered at a drug or alcohol rehab clinic.